Is Ohio State already scrambling to find a new men's basketball coach? Is Ohio State already scrambling to find a new men’s basketball coach? Are the Buckeyes in scramble mode already? On Wednesday, seemingly out of the blue, Oklahoma football coach Bob Stoops announced his resignation as head coach and Oklahoma officially handing the program over to young offensive coordinator Lincoln Riley as the new head coach. It was a smooth transition of power, if you will, and showed Oklahoma had everything mapped out for a coaching change if and when Stoops decided the time had come to step aside. Though surprising, Oklahoma was prepared for the transition and rolled it all out according to plan and can now quickly move on to prepare for the upcoming college football season. In Columbus, Ohio, a much different situation is playing out with the Ohio State men’s basketball program. 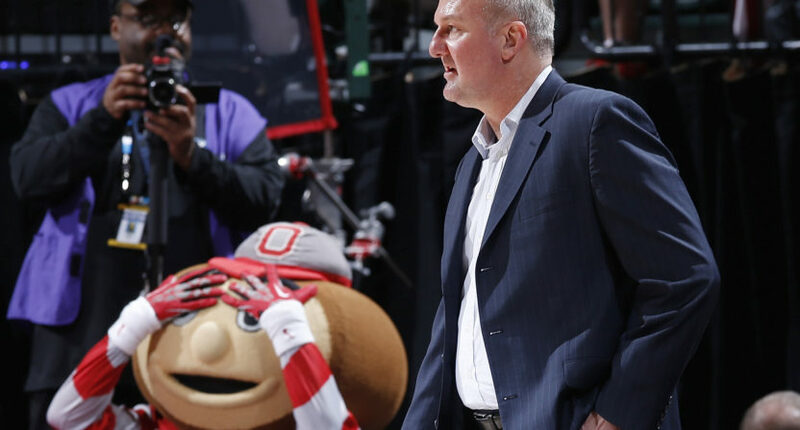 On Tuesday, one day before Oklahoma’s stunning coaching development, the Buckeyes held a press conference to announce the firing of head basketball coach Thad Matta. You would have thought Ohio State would have an alternate coaching candidate waiting in the wings just sitting by for when all of the Matta fallout is taken care of in an official capacity. But the Buckeyes seem to have swung and missed twice already on securing a new head coach for the program. Creighton head coach Greg McDermott proclaimed his loyalty to the program on Twitter on Thursday afternoon with a tweet that usually seems to come from coaches after rejecting offers from other potential suitors. It was reported Wednesday by multiple reports Ohio State had offered the job to McDermott. Another potential candidate supposedly targeted by Ohio State was Chicago Bulls head coach Fred Hoiberg. According to the Chicago Tribune, Hoiberg has no intention of leaving the Bulls. With two candidates showing no interest publicly about the Ohio State job, the focus is now set on Ohio State athletics director Gene Smith and his decision to move on from Matta when he did. It is every AD’s responsibility to have a short list of names for potential coaches filed away for whenever the time may come you need it. If the top two names on Smith’s list were McDermott and Hoiberg, then he had to feel pretty darn confident Ohio State would have been able to lure one of those guys to Columbus before canning Matta at this point on the calendar. If you are gonna fire Matta in June, you may wanna have a plan. And not sure best course action is to ask Fogler for help. Overall, Ohio State’s athletics department has been having plenty of success across sports under Smith’s leadership as AD, and much of that gets overshadowed by what happens with Ohio State football and men’s basketball. With that being the case, Smith hit an absolute home run in hiring Urban Meyer. That was an easy call. Basketball is much different for Ohio State though, and the early stages of the coaching search are proving that. Ohio State is not going to get one of the top coaches on the basketball market to come to Columbus, but they can still hire a good coach. Hiring a big name coach is something Ohio State should aim for and may still accomplish, but after missing out on a couple of potential targets, the expectations are probably getting lower by the day for the next head coach of Ohio State, at least from the casual point of view. There is one other thing to keep in mind here, and that is that coaches lie. They lie a lot. So maybe Ohio State does end up hiring McDermott or Hoiberg, and all is forgotten. But until that happens, the search goes on with much scrutiny at Ohio State.